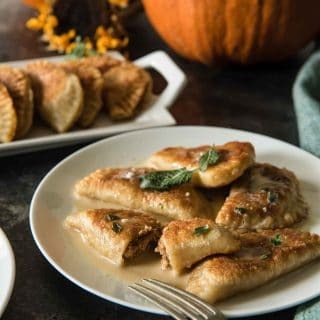 A seasonal take on Nana’s Polish dumplings, these Pumpkin Walnut Sage Pierogi are extra delicious when paired with a brown butter cream sauce! I wonder how my Nana would feel if she could see what I did to her classic pierogi. I took out the potato and onion and stuffed them with pumpkin, ricotta, and walnuts. 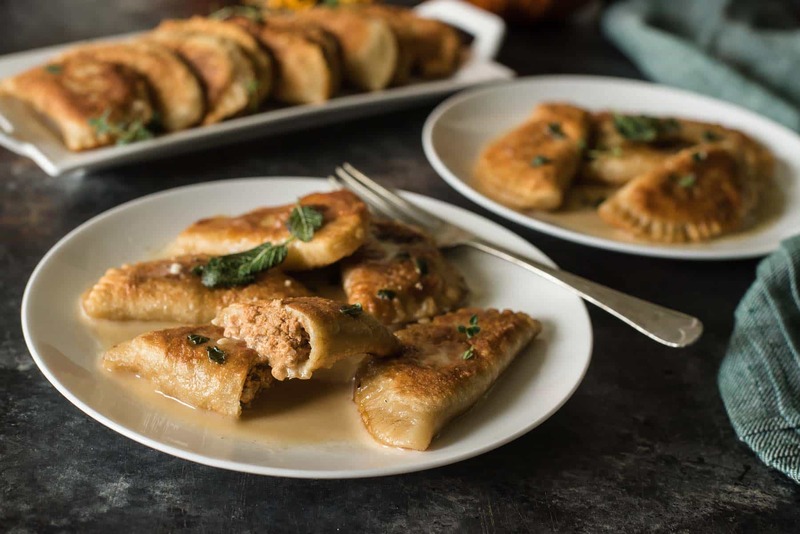 Very fall, almost ravioli-like Polish dumplings, doused in brown butter cream sauce instead of sour cream. No lie, Abe ate 3/4 of these himself, which shocked the hell out of me since I didn’t really think he’d like them at all. He ate them more like empanadas – didn’t even bother with the sauce. His loss. 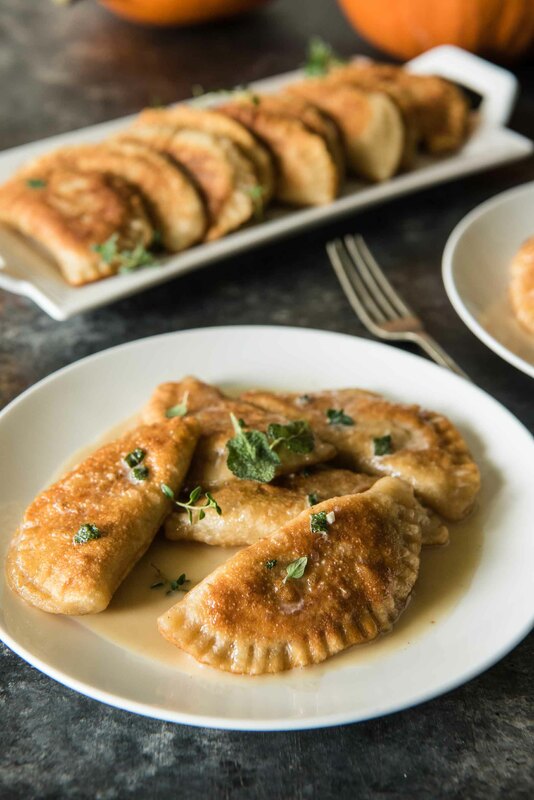 Pierogi have long been on my list of things to make from scratch. I remember Nana making them a few times when I was a kiddo, but more often than not the frozen ones made an appearance for dinner. They’re pretty labor intensive, so I don’t blame her for taking an easier route with the boxed ones. The dough reminds me of a combination of bread and pie dough. It’s very delicate and soft, and though it’s easy to tear, it’s just as easy to repair. As with anything that I’m making for the first time, I was probably a little too gentle with it. My finished pierogi definitely could have been thinner and larger, but I was so afraid of ripping them or overstuffing them. Still, once these babies hit butter, any fear of tough or bland pasta dough was gone. 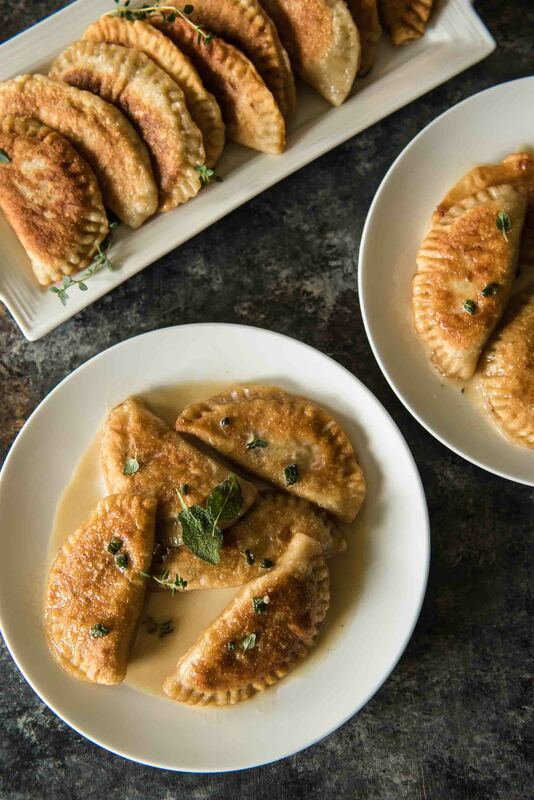 I like my pierogi nicely browned, with a little bit of crunch – after all, they aren’t ravioli. They don’t have to taste like pasta. Discovering my little workaround brown butter sauce hack is probably what I’m happiest with about these. 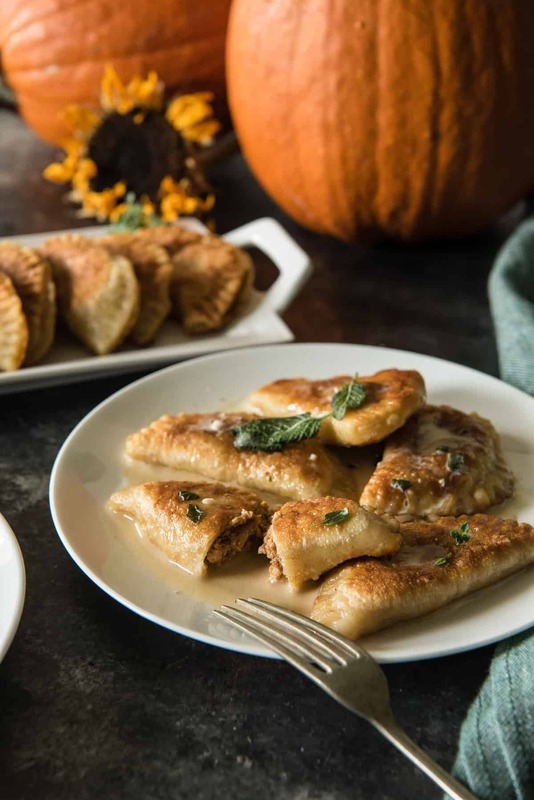 In total, you get 25-30 pierogi out of this recipe, and you can only fry 6, maybe 7, at a time. Each batch of pierogi need 3 to 4 tablespoons of butter to properly fry and not scorch, and you really need to use fresh butter with every batch. Unless you like burnt butter. And I promise – you don’t. 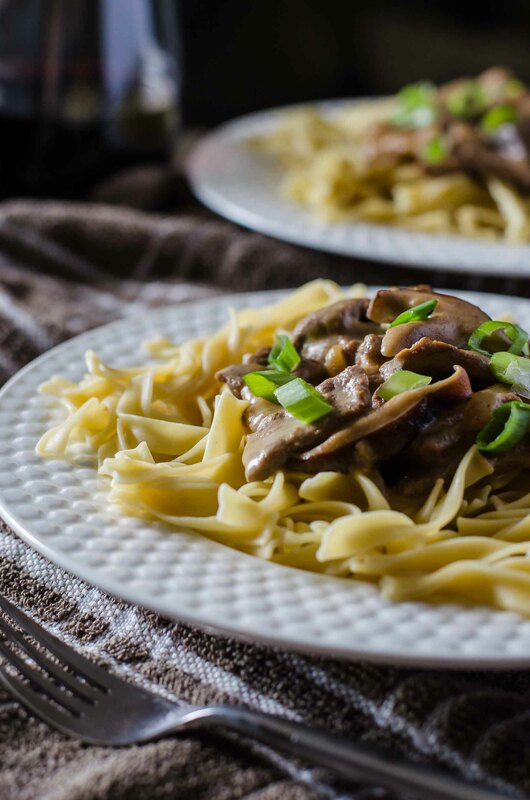 Instead of disposing of the butter after every batch, hang on to it – it’s already browned, which saves you extra waiting time when you throw your sauce together right before you serve dinner! It will be the quickest, easiest part of making these, aside from cracking open your can of pumpkin puree. 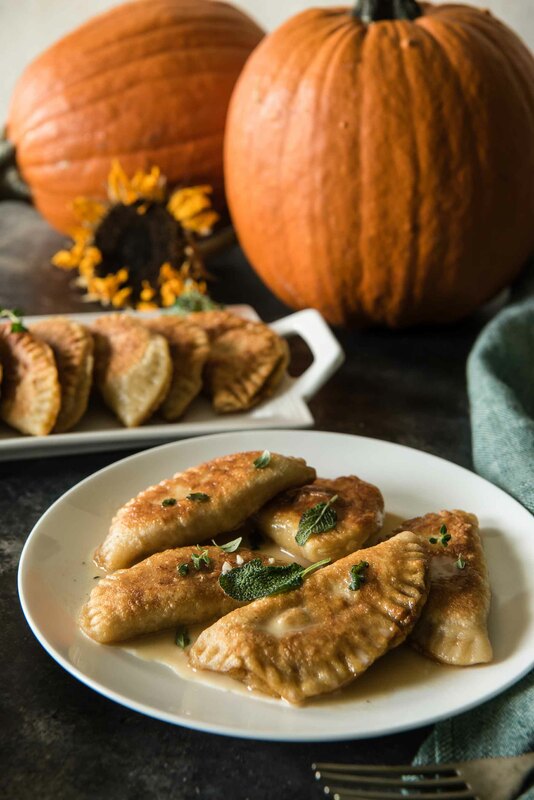 A seasonal take on Nana's Polish dumplings, these Pumpkin Walnut Sage Pierogi are extra delicious when paired with a brown butter cream sauce! Combine all ingredients for filling and mix well. Cover and refrigerate until ready to use. In a bowl, whisk sour cream and egg together until well blended. Add flour and salt, kneading the mixture into a dough with your hands until the flour is incorporated. Cover bowl with plastic wrap and rest for at least 30 minutes in the refrigerator. Divide dough in half, leaving half in the refrigerator and placing the other half on a lightly floured work surface. Using a lightly floured rolling pin, roll dough out to 1/4" - 1/8". Use a large biscuit cutter or 3-inch round glass to cut dough circles. Flip the dough so the sticky part is facing up. Stretch the round slightly, then add about 2 teaspoons to 1 tablespoon of pumpkin filling to the center. Gently fold the dough over and press it closed with your fingers, then use the tines of a fork to secure the seal. Continue with remaining dough, place folded pierogi on a floured baking sheet. Bring a large pot with water and salt to a boil. Gently place 8-10 pierogi in the water at a time, boiling for about 3 minutes until they float to the top on their own. Remove pierogi to a colander and rinse with cold water, dry, and place on a plate. Repeat with the rest of the pierogi. In a large skillet set over medium-low heat, melt 3 tablespoons of butter. Add a single layer of pierogi and brown them, 2-3 minutes, on each side. Remove to a paper towel-lined plate. Carefully pour browned butter from skillet to a small saucepan, then wipe out skillet with paper towel. Repeat process with fresh butter for each batch, reserving browned butter each time. 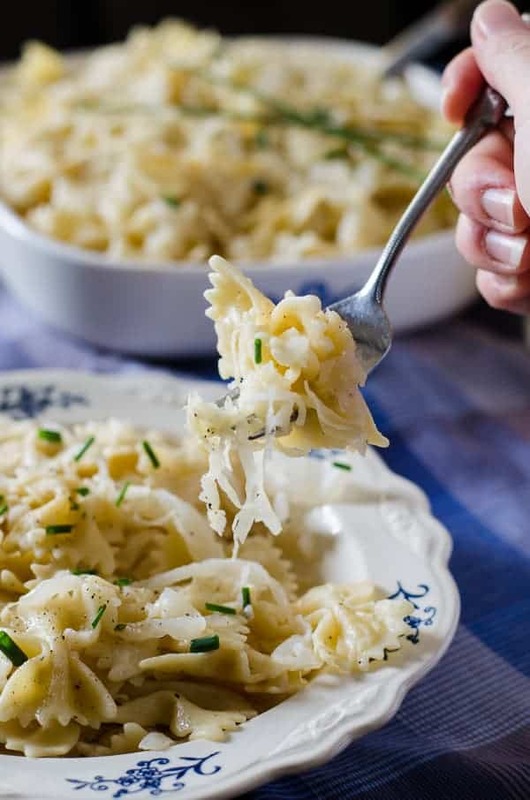 Place the small saucepan with the reserved brown butter over medium-low heat, adding another 2 tablespoons of fresh butter and allowing it to melt together. When butter begins to foam, add sage and garlic and saute for about 1 minute. Carefully whisk in broth and cream and bring to a simmer for 2-3 minutes. Season to taste with salt & pepper. Serve over pierogi. Hungry for more pasta? Try one of Nana’s other delicious recipes! Oh my….I’m sure my MIL will turn over in her grave, God rest her soul, but I am going to make these anyway. They sound absolutely amazing. 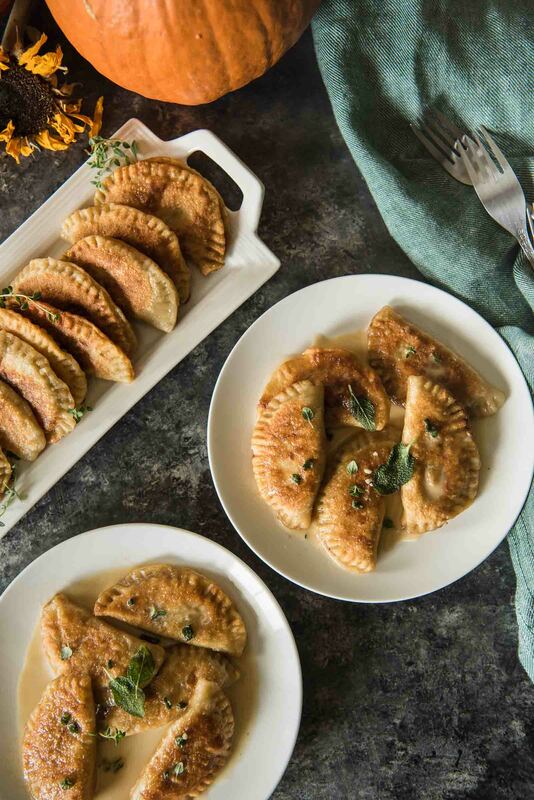 There are certain recipes that I want to try and this is one- I love pierogies but have never made them from scratch. And the brown butter…yum!